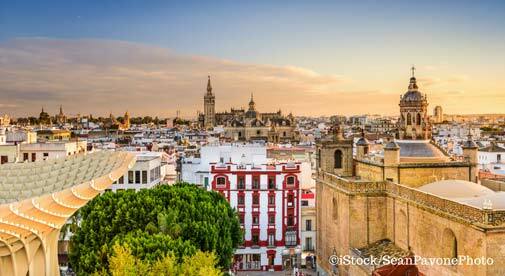 Seville is a city that’s easy to love on the surface—it boasts Moorish architecture, the largest gothic cathedral in the world, and innumerable plazas tucked away under orange trees. Tapas bars come alive as dusk falls, and the spring festivals of Holy Week and the Feria de Abril are vibrant and raucous. I fell in love with Seville—and with a local—almost as soon as I arrived. In Seville, people live for their aperetivo, religion, and the city itself. They’re fiercely loyal—whether it’s to their family or their fútbol team—and tend to be funny, fun-loving, and enjoy being outside. And now that I’ve been here for a decade, I find myself being the same. After studying abroad in college, and wanting to escape the Chicago winters, I chose to take part in a cultural exchange program in exchange for a visa, a stipend, and health insurance. The cost of living here is low so I can afford to travel, pursue hobbies, and even buy a plane ticket home once a year. My home is in the Triana neighborhood of Seville, just a stone’s throw from the center of the city. It’s a bustling neighborhood favored by locals. My mortgage is less than $500 a month before taxes and bills, which rarely stretch to more. That said, air conditioning is a luxury during the sweltering summer months and as homeowners, we have to fix anything that breaks, pay for parking, and pay a local property tax. But all of that comes with an enormous third floor terrace so the tradeoff is worth it. One of my favorite things about life in Spain is shopping at the local market. Fali prepares my fish and Jose Antonio’s oranges—a staple in southern Spain—come right from his garden. Our green groceries, meats, fish, and a few dry staples run us $29 to $35 a week for our family of three. Coupled with a bike-friendly city and the ability to leave the car parked until a weekend trip to the beach or the mountains beckons, we almost don’t need to pay for the gym. Entertainment is cheap, too. My husband and I can easily go out for a few beers and have tapas with wine for less than $24 each. There’s no way I could have this lifestyle for the same price at home in Chicago. People often ask me how my life is different in Spain to the life I had in the U.S. The short answer is that I live my life as I would in the U.S., just speaking in Spanish…but really it goes beyond that. My quality of life has improved in so many ways. I’m active (and get to walk or bike to work), eat well and plentily, live in a metropolitan city with ample cultural offerings and still have money at the end of the month to squirrel away for my baby’s college fund or to invite my husband for a few beers. I have a job I truly enjoy and have socialized healthcare. Truthfully, I feel most at home in Seville.